The gang discusses how one acquires the skills most frequently used by engineering professionals. Brian knows that parliamentary procedures are described in Robert’s Rules of Order, but he has not had to use such procedures in the course of his engineering career. A quorum is the minimum number of voting members from a deliberative group allowed to make decisions on behalf of that group. This episode covers the skills commonly used by practicing engineers. According to the Kelly report, approximately two-thirds of each graduating class from MIT’s Mechanical Engineering Department will find employment as engineers and managers. As the number of years beyond graduation increases, the percentage of engineers decreases, while the percentage of managers increases. Brian references a 2014 article from the ABA Journal claiming that 24% of those who passed the bar in 2000 were not practicing law a dozen years later. Kristen Wolfe authored a 2004 thesis, “Understanding the careers of the alumni of the MIT Mechanical Engineering Department,” in which she surveyed MIT alumni about the skills they used in day-to-day engineering practice. Brian notes that a good deal of his work involves trying to fight his own confirmation bias. In 2015, Kelly Wang produced a thesis, titled “Study on the Careers of MIT Mechanical Engineering Undergraduate Alumni.” This report confirmed many of the findings from the 2004 Wolfe study. 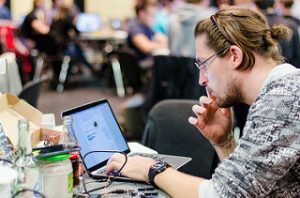 Thanks to TechCrunch for use of the photo titled “TechCrunch Disrupt Europe Hackathon.” Opening music by John Trimble, and concluding theme by Paul Stevenson.